Lot:9424 Fr. 2201-Blgs. 1934 $500 Federal Reserve Note. PMG Gem Uncirculated 65 EPQ. Fr. 2201-Blgs. 1934 $500 Federal Reserve Note. PMG Gem Uncirculated 65 EPQ.U. 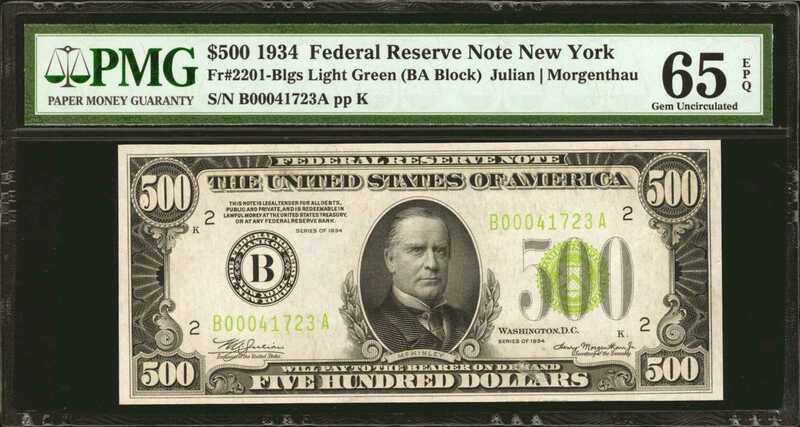 S. Bureau of Engraving & Printing records indicate that a mere 288,000 1934 series $500 New York Federal Reserve Notes of pall seal color varieties were printed, yet PMG & PCGS Pop records attest that only one Gem 1934 $500 NY Light Green Seal, the present lot, is known to survive. That a huge printing can result in only one surviving gem can only be understood by examining BEP policy concerning high denomination notes at the time of issue. Unlike coin mintages, which represent the actual number of coins released into circulation, print quantities reported by the Bureau of Engraving & Printing for high denomination notes represented an estimate of the maximum # of notes needed by a given district; they were keep in inventory & released as needed; if demand did not meet projections, as happened during the great depression, all surplus notes were destroyed, sometimes up to 80-90% or more of the entire print run. Just like 1934 New York $500s, 1928 New York District $500s fell victim to similar massive destruction of almost the entire print run, as PCGS & PMG census data indicates that not one Gem 1928 New York $500 in either LGS or DGS has been graded. So we have here tonight a Mind-Boggling Rarity; the only New York $500 Gem of any seal color known to exist for both 1928 & 1934 Series $500 Federal Reserve Notes. Superb embossing margins & inks & striking originality add to the notes mystique. Providing an auction estimate on a one of a kind rarity like this is daunting, so suffice it to say that we expect that existing records may well fall tonight.pFrom the Stradivarius Collection.